If your time is short, listen to the 2:52 - 4:32 segment of Joseph DiGenova's take on the Mueller report. If you have a little more time, you will want to hear DiGenova boldly predict trouble ahead for the government conspirators against Trump. I am sure a particular Trump-despising friend of mine will fume and fuss and maybe explode at the very thought that there could be trouble ahead, but that of course, would be to prejudge the future. We must wait and see. Former CIA director John Brennan made numerous calamitous predictions that Trump would be found guilty of "Russian collusion" which kept the Left wing media excited, but which fizzled and bombed and thoroughly discredited Brennan as a commentator and prognosticator. Now former United States Attorney, District of Columbia, Joseph DiGenova has mounted the stage and has offered predictions of his own. (Predictions begin around the 11:02 mark.) Let's see what the future brings. My bet is that his predictions concerning Brennan, Comey, Struck, and McCabe will turn out eerily accurate and come as a bombshell to the Leftist media. And if it can be demonstrated, as DiGenova is convinced, that former President Barack Obama was in on the plot to discredit and remove Trump from the beginning, the Left wing media will need to crank up its spin machine to a level it has never been cranked up to before. Trump and his campaign WERE bugged by the FBI during the campaign. Based on standard procedures, this could not have been done without Obama’s knowledge. So it is fair to say that Obama was part of the plot, if not central to it. It was a concerted attempt by a sitting president and his justice department and FBI to prevent the election of Donald Trump and, after he was elected, to subvert and overthrow his presidency. That is the very definition of treason. JONAH GOLDBERG'S NEW BOOK: "SUICIDE OF THE WEST: HOW THE REBIRTH OF TRIBALISM, POPULISM, NATIONALISM, AND IDENTITY POLITICS IS DESTROYING AMERICAN DEMOCRACY"
Update 6/11/18 - Ben Shapiro posted a major, one-hour video interview with Jonah Goldberg yesterday. Anyway, if you’ve already bought it: thank you. If you plan on getting it, today is a good day for that kind of thing. If you want to hear or read more about it, you can hear me discuss it with Russ Roberts on EconTalk here, with Bill Kristol here, with John Miller here, or Matt Lewis here. I also talked to NPR’s Steve Inskeep about it yesterday. And here’s is the excerpt adapted from the introduction from the current issue of National Review. And here’s MBD’s thoughtful essay on it. If you, like me, have creaking book shelves and find yourself short on time and money, it can be pleasurable to watch the interviews and read the excerpt Goldberg supplies. You have probably heard that Dennis Prager, a prominent conservative author, columnist, and talk show host, recently conducted the Santa Monica Symphony Orchestra but not without hysteria generated by a few left wing musicians and the smearing of Prager by the New York Times, the Los Angeles Times, and NPR. I suggest carefully reading carefully Prager's dissection of the tactics employed by these news outlets in smearing him since it is a microcosm of the slanted news that pervades the country every day. Prager titles his analysis "How the Mainstream Media Operate: A Case study in how the media conducts its war against conservatives." Lesson No. 1: When the mainstream media write or say that a conservative "suggested" something that sounds outrageous, it usually means the conservative never actually said it. Lesson No. 2: When used by the mainstream media, the words "divisive" or "contentious" simply mean "leftists disagree with." Be sure to read the whole article. One needs to be informed and fortified to detect the bias that is everywhere. Tucker Carlson's interview with Shelby Steele deepened my understanding of liberals. I gained insight into the modern American liberal's profound sense of moral superiority and identity which renders ideological conversation and debate impossible. An opponent is evil and his or her speech must be shut down. Shelby Steele's Wall Street Journal article which occasioned the interview is titled, The Exhaustion of American Liberalism. Liberalism is not an ideology. It is an identity. People who think of themselves as liberals really are adhering to an identity, to the idea of "my personal self." I am the kind of person who is above racism, who is above sexism. And if you take that position that I don't like, then you are challenging not just my ideas, but you are challenging me as a human being with a particular identity and that is why the passions, the ferocity of the Left that we see today in the streets and elsewhere. DINESH D'SOUZA ON "TRUMP DERANGEMENT SYNDROME"
D'Souza delivered a really terrific speech at Trinity University in San Antonio, Texas on March 7, 2017. He knows history as few others do, and tells facts about fascism, slavery, and the Democratic party that will astonish you. Stay tuned for the Q&A. Terrific. Note: the video has a long lead-in. The introduction doesn't begin until about the 19:30 minute mark. DAVID HOROWITZ - "THE WAR AGAINST TRUMP"
As I explained in my book Big Agenda: President Trump’s Plan to Save America, the source of this civil war mentality is a profound rejection of the American idea. This is the idea that we are equal citizens regardless of our origins, and that we are accountable as individuals for what we do. The left’s creed – identity politics – is an anti-American, racially charged determination to reject individual accountability and individual freedom, and to establish in their place group privileges, and racial/gender hierarchies. These hierarchies are based on the malicious premise that whites, heterosexuals and males are oppressors and - in the words of the Democratic platform - America is a society governed by “systemic racism,” which needs to be fundamentally transformed. This collectivist, racial creed is the heart and soul of today’s Democratic Party and its allies in the mainstream media. It is the inspiration for the war Democrats have declared on the newly elected government of Donald Trump. In his inaugural address, Trump addressed the war in uncompromising but thoroughly American terms. “Through our loyalty to our country, we will rediscover our loyalty to each other…. When you open your heart to patriotism, there is no room for prejudice…. Whether we are black or brown or white, we all bleed the same red blood of patriots, we all enjoy the same glorious freedoms, and we all salute the same great American Flag.” This is the American creed, and it is the voice of the American people who elected Trump in November 2016. Brooks has written insightful books, but as a political analyst his judgments are often faulty. He predicted Obama would be an effective president because he was impressed with the crease in his pants! He slurs and slanders the Trump administration by throwing around loaded terms such as "ethnic nationalist administration" and to accuse the administration of the "aroma of bigotry" is itself cross-eyed propaganda alien to facts. Trump hasn't done anything he didn't say he would do and the countries identified for specific scrutiny are the ones singled out by the Obama administration. One must understand that the left is determined to discredit this administration no matter what it does. It is at war. (Cf. the delay in confirming cabinet choices). Yes, Trump is a loose cannon in many ways, and the administration could have gone about things more wisely, but the issue goes beyond Trump's character and personality; the left simply cannot allow a "wrecking ball to political correctness" to succeed. Political and philosophical commitments are at stake! If Trump does endure, it certainly won't be with the help of the media. To join hysteria without delving into facts and agendas makes for huge confusion. Dennis Prager consistently offers thoughtful, astute, and succinct observations on life and culture. I almost always find his observations compelling. He is the author of a number of books including The Ten Commandmens: Still the Best Moral Code. He is a nationally syndicated radio talk show host and creator of Prager University.com which offers important short video [YouTube] commentary on issues of the day. What follows is his guide to basic differences between Left and Right. In almost every case I think he is right on target. Filmmaker and American citizen Agustin Blazquez never thought his native Cuba would become a communist country, but now he sees the same radical shift happening in America. In a video, Agustin Blazquez says The left has been clever by using “very non-threatening words,” like liberal, progressive and concerned citizens, for advancing government control of American lives. The truth about Cuban politics is hard to find because of media spin and propaganda dominating American discourse. WASHINGTON -- This summer, the U.S. military is planning an unprecedented training exercise, happening across seven states on private lands and towns in the Southwest. The Jade Helm 15 operation is making many residents feel uneasy. Speculation about why the military wants to train in American communities instead of on military bases is fueling a growing number of theories across the Internet and social media. Texas Gov. Greg Abbott has even asked his National Guard to monitor it. So what is Jade Helm 15? According to the U.S. Army Special Operations Command, it's "realistic military training" taking place simultaneously in seven states from Southern California to Texas. Over eight weeks, America's elite Special Forces will practice "unconventional warfare" by practicing operating outside their normal support systems, adapting to new terrain, and working with civilians to gain their trust. When news of the operation broke, the phones inside Texas Rep. Louie Gohmert's office lit up. If you think the media uses credible and honest sources to report the news, think again. You'd be surprised at how many "mainstream" outlets rely on a left-wing advocacy organization funded in part by liberal billionaire George Soros. The organization is called RightWingWatch and tracks the statements of conservative politicians and leaders for the sole purpose of feeding distorted -- and sometimes even fabricated -- versions to their allies in the media. Now, it's no surprise that press who are outright hostile to conservative views like Huffington Post rely on RightWingWatch's propaganda, but it is shocking that that this kind of truth-optional reporting is utilized (and therefore legitimized) by mainstream networks like CBS, Politico, and others. The corrupt CBS News gets exposed by ex-investigator reporter Sharyl Atkisson in her new book, Stonewalled, an overview of which can be read here. If you read the article, your anger will rise and your respect for major news organizations like CBS will fall. Unless, of course, you approve the suppression of news, think cover-ups are fine, and regard news-managed propaganda to shore up your ideological bias perfectly acceptable. Americans are only just now waking up to a quiet but devastatingly effective effort to replace the teaching of traditional American history in our high schools with a new, centrally-controlled, and sharply left-leaning curriculum. The traditional emphasis on America’s founders and the principles of constitutional government will soon be jettisoned in favor of a left-leaning emphasis on race, gender, class, ethnicity, etc. The Family Research Council offers an account of an amazing story of liberals acting breathtakingly stupid. California's Central Valley is known as "the salad bowl of the world" -- but that salad's about to get tossed, if the Left doesn't stop angling for special fish protections. Under some of the worst drought conditions the region's ever seen, communities may be 60 days away from running out of water altogether. While people panic, especially farmers of the rich asparagus, broccoli, onion, tomato, lettuce, and garlic crops, liberals are fighting the push to divert millions of gallons of water away from an endangered fish habitat to parched locals. "Without water, we can't work," said the head of Harris Farms. "It's not healthy. Without knowing how much water we're going to get, it's so difficult to plan!" If a pistachio tree takes five to seven years to grow, "how can we plant one now if we can't guarantee we can water it in a couple of years?" Yesterday, recognizing the desperate situation of farmers and families, the House debated a bill that would roll back the area's environmental protections long enough to save the harvest. 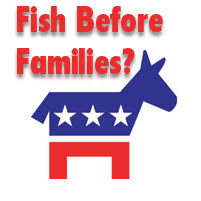 But fishing for liberals' support was tough, especially in a party willing to leave families thirsty for the sake of a three-inch fish called the delta smelt. TONIGHT! - DINESH D'SOUZA & BILL AYERS DEBATE "WHAT'S SO GREAT ABOUT AMERICA?" UPDATE: - Full debate available here. The debate is well worth watching for the clear perspective it affords on how leftists view America. D'Souza's performance was stunning for its excellence. The debate will be live-streamed at 7:30 PM (EST) You can watch free by clicking here. D'Souza writes: "Tune in tonight and join the conversation during the debate by using #AyersDSouza on Twitter. Our streaming page will pull your Twitter comments and post them for all viewers to see." INTERNATIONAL ADOPTION: IS THE LEFT LAUNCHING AN ATTACK AGAINST EVANGELICALS? Thanks to the publication of Kathryn Joyce’s new book, The Child Catchers: Rescue, Trafficking, and the New Gospel of Adoption (excerpted here in Mother Jones, and Ms. Joyce is interviewed here at NPR), there’s been an online wave of criticism/examination of Evangelicals’ so-called orphan fever. To some, conservative Christians are incentivizing child-trafficking, engaging in a form of cultural imperialism by yanking children from their native cultures and evangelizing them into Christianity, soothing pro-life conscienses wounded by lack of concern for babies after they’re born, and trying to engage in charity without adjusting underlying world views about social justice and the need for systemic change. Before I go any further, let me be clear about my biases: I’m the adoptive father of a beautiful girl from one of the countries highlighted in the NPR interview, Ethiopia. My sister has adopted a special-needs child from China, and our church is full of adoptive families, mostly with international adoptions. Many of these kids also have special needs. In short, adoption has been a great blessing in my family’s life, and in the life of our church. But my second response must be less emotional — because the critics do have a limited point. It is simply a fact that there have been abuses within international adoptions. There has been child trafficking. There have been lies told to adoptive parents. And there are actual horror stories — not widespread, but horrifying nonetheless (perhaps the most famous recent incident was of the Tennessee mom who inexcusably and reprehensibly sent her seven-year-old child back to Russia, alone). Ben Shapiro, editor of Breitbart, recently appeared on CBN. I'm not sure when I've ever heard more succinct, to-the-point responses in my life. Bullying: In Washington, it's politics as usual, with some of the biggest offenders being those who protest against the practice the most. Bullying has morphed into what some call the Left's "go-to tactic" to squash opponents through fear, threat of force, and rhetorical intimidation. At least that's how Breitbart.com's Editor-At-Large and national best-selling author Ben Shapiro sees it. . .
Shapiro addressed the issue of political bullying in his newest book, Bullies: How the Left's Culture of Fear and Intimidation Silences America. The Harvard Law graduate writes of how liberals and the media are the true culprits, playing the race, class, and sexism card all the while claiming to be victims. But don't expect the mainstream media to report it. They blacken and falsely accuse conservatives at every turn, but avert their eyes when a liberal activist attempts to kill conservatives. Remember the story of the man who arrived at the Washington offices of the Famly Research Council intent on mass murder? Read on. . . It seems hard to believe, Jim Treacher wrote yesterday, "but once upon a time, there was a shooting the national news didn't want to talk about." That's because the shooting was at FRC. And although the gunman was a politically-motivated activist who stormed a building less than a mile from the White House, there's a reason most Americans have never heard of him. After years of insisting that conservatives were the hateful ones, the attack at FRC was an inconvenient storyline for a media bent on hiding where the real intolerance lies. The day after Floyd Corkins walked into our headquarters and opened fire, I said that while Corkins was responsible for the shooting, he had been given a license to perpetrate this act of violence by groups like the Southern Poverty Law Center (SPLC) which has recklessly labeled every organization with which they disagree a "hate group." The media insisted we were overreacting. But yesterday in federal court, prosecutors explained that FRC had it right all along. In the official filing, FBI evidence verifies the fact that Corkins was inspired by SPLC to target our office. "He was a political activist," the statement read, "and considered the FRC a lobbying group. He committed the shooting for political reasons. He had identified the FRC as an anti-gay organization on the Southern Poverty Law Center Website." Federal prosecutors read the statement of offense and then described FRC and our mission. No other organization was mentioned by name, but it was noted that Corkins had other social conservative groups on his hit-list. Of the many charges leveled against him, Corkins pleaded guilty to three, including domestic terrorism. "On August 15, 2012, the defendant assaulted [Leo] Johnson and the FRC with the intent to... coerce a significant portion of the civilian population of the District of Columbia and/or the United States; namely, any and all individuals associated with or supporting FRC, like-minded organizations, or otherwise holding beliefs contrary to or advocating against gay marriage." Corkins confessed to Judge Richard Roberts that he hoped to intimidate gay rights opponents--which is exactly what SPLC has tried to do with its reckless labeling. And unfortunately for our own Leo Johnson, who was wounded in the attack, SPLC doesn't draw the line at name-calling. It insists on pinpointing FRC's location on the SPLC "hate map" as an open invitation to extremists like Corkins, who admitted yesterday that he intended to "kill as many as possible and smear the Chick-fil-A sandwiches in victims' faces." It would be a statement, he told the court, "against the people who work in that building." Although Corkins pleaded guilty, SPLC has yet to admit its role in creating this hostile environment. Even after an attempted mass murder of the FRC staff, the "hate map" is still prominently featured on the SPLC website today--which shocks most conservative pundits. "When Congresswoman Giffords and several others were shot in Arizonaby Jared Loughner, the Left went into overdrive blaming Sarah Palin for a map that had a list of political targets on it. After the fact, we learned that Loughner was apolitical and he clearly had not used Sarah Palin's map of political targets. That did not stop the Left from blaming the right," said RedState's Erick Erickson. "By the way, Palin took down her target map after the controversy. The Southern Poverty Law Center? Crickets..." The Daily Caller's Treacher shakes his head at the double standard. "Now we have another [shooter] and another map. Except this time, the [shooter] is pointing directly at that map and saying, 'That's why I picked those people.' But since the targets of his thwarted rampage don't hold the correct opinions, they don't count." The bottom line is that the Southern Poverty Law Center (the same one embraced by President Obama's Justice Department), is dangerous and driven by an anti-Christian animus. Their leaders are inciting hatred, and in this case, a clear connection to violence. They need to be held accountable, and they need to stop before people are killed for supporting traditional values. Only by ending its hate labeling of Christians will SPLC send a message that it no longer wishes to be a source for those who would commit acts of violence against Americans whose only crime is thinking differently than the radical Left. But whether the SPLC continues to demonize Christians or not, I can guarantee one thing: the Family Research Council team will not be distracted from our mission--not by bullets and certainly not by bullies. [...] Most American elementary schools and high schools, and nearly all colleges and universities, teach everything that is significant from a liberal/left perspective. Multiculturalism has replaced E Pluribus Unum; the American past is villainous; the country is racist; morality is relative; and the left-wing cause of the day -- now global warming -- is taught as incontrovertible truth (ask your children if they have been shown Al Gore's global warming video, "An Inconvenient Truth," or if they have been taught both sides of the man-made-global-warming-leading-to-catastrophe hypothesis). A long time ago schools taught American history, not Politically Correct American history, as mandated, for example, by California law -- which forbids the use of any textbooks that do not emphasize the roles of women, blacks, Hispanics, gays, lesbians, bisexuals and the transgendered. . . .
.. . The left has been utterly clear about what leftism stands for and has used schools, the news media and the entertainment media to transmit its values. As a result, the American trinity of Liberty, In God We Trust, and E Pluribus Unum have been supplanted with egalitarianism, secularism, and multiculturalism -- Europe's trinity. The accusation: that FRC supports the death penalty for homosexuals in Uganda. Totally false. It doesn't. But liberals spread their lies fervently. And that produces hate. And hate produces killers. One man recently tried to kill all the members of the FRC office staff. It used to be that the media reported the story. Now they are the story. With fewer journalists able to separate the news from their personal politics, groups like FRC are no longer fighting bias--but outright deception. If you read Monday's Update or follow me on Twitter, then you know that FRC was highly complimentary of Ugandan President Yoweri Museveni, who took the bold step of leading his country in a public prayer of confession for a multitude of sins Uganda committed over the last 50 years, including the genocide of Idi Amin. "We want Uganda to be known as a nation that fears God and as a nation whose foundations are firmly rooted in righteousness and justice..."
Not surprisingly, the U.S. media wasn't nearly as impressed by this gesture as FRC--a fact I alluded to in a tweet that same day. "American liberals are upset that Ugandan Pres is leading his nation in repentance--afraid of a modern example of a nation prospered by God?" Well, as we learned two years ago, if you want to get the press's attention, just say the word "Uganda" and wait for the firestorm. For years, the African nation has been condemned for its severe laws criminalizing homosexuality. Despite allegations to the contrary, FRC has never supported that policy--or any policy that imposes the death penalty on homosexuals. What we do oppose is the suggestion that gay and lesbian acts are universal human rights. So when Congress introduced a resolution in 2010 denouncing Uganda's punishment for homosexuality, FRC fought--at the request of some Members--to strike the pro-homosexual "human rights" language from the final measure. Several liberals, including David Weigel at the Washington Post, chose to misrepresent our involvement as an indication that we opposed the entire bill! "Family Research Council Lobbied against Resolution Condemning Uganda Anti-Homosexuality Law," Weigel's headline read. It was a convenient storyline for extremists like the Human Rights Campaign (HRC) who resort to demonizing FRC when they can't compete with us ideologically. Although Weigel later posted a retraction, the damage had already been done. Now, more than two years later, the lies about FRC's position have resurfaced. After Monday's story, HRC had the audacity to post that by applauding President Museveni, FRC was "praising the 'kill the gays' bill." I challenge anyone with a half a brain to read my tweet or Update story and conclude that FRC is any way supporting the death penalty of homosexuals. But gay activists have their hooks so deeply in the mainstream media that reporters no longer bother to check their facts. Once the blogs start spreading the lies of organizations like HRC and SPLC, they percolate up to reporters like Carolyn Lochhead at the Seattle Post-Intelligencer, who regurgitate HRC's garbage without so much as a courtesy call to our office. And these aren't harmless little lies either. They're the same intentional misrepresentations that led to the controversy over FRC's alleged ties to Chick-fil-A--culminating, as you may remember, in the violent shooting of one of our own employees! Americans need to understand that this cozy relationship between the liberal media and unreliable sources like HRC is fostering a culture of hatred and violence--that same culture that led to the attempted mass murder of the entire FRC office. While it's troubling that any organization would deliberately spread untruths, it's more disturbing that someone who claims the title of journalist would report these lies as fact. Is it any wonder that distrust of the media is at an all-time high? Update 11/30/12 - Current news is that Uganda's anti-homosexuality bill will not contain the death penalty. Forget honest arguments. Destroy your opponent, that's the modus operandi of the Left. The left's demonization, personal vilification, and mockery of its opponents have been the most powerful tools in the left-wing arsenal for a century. DENNIS PRAGER - "NOVEMBER IS A PLEBISCITE ON THE AMERICAN REVOLUTION"
Election Day 2012 will not be a presidential election. It will be a plebiscite. Americans will not only be voting for a president (and a House and a third of the Senate). They will be participating in a plebiscite on the definition of America. If Americans reelect the Democrat, Barack Obama, they will have announced that America should be like Western European countries — governed by left-wing values. Americans will have decided that America’s value system — “Liberty,” “In God We Trust,” “E Pluribus Unum” — should be replaced. The election in November is therefore a plebiscite on the American Revolution. The usual description of presidential elections — “the most important in our lifetime” — is true this time. In fact, it may be the most important election since the Civil War, and possibly since America’s founding. Michelle Malkin lists some of the disgusting epithets thrown at her and other conservative women. Plus, ShePAC strikes back at misogynist Bill Maher with a video.